Anna-Lena Werner: "_ _ _ _ / / / / O / O / O The mouth expresses thoughts. The landscape renders its tone!" is an exhibition of selected works by the Fluxus artist Henning Christiansen at Kunsthal 44 Møen and an on-going performance project responding to the artist’s notions of language corresponding to nature. How did your idea for the project come about? Nico Anklam: I first came to Kunsthal 44 Møen in 2013. When I told Ursula Block, the director of the sound art gallery GELBE MUSIK and René Block's wife, a year later about my Danish being good enough to recognise the differences between Danish, Swedish and Norwegian, she told me about a text that Henning Christiansen once wrote about the sound of these languages. That was the starting point for the whole project. She gave me a typewritten piece of paper by Henning, which ends with him describing Danish as flatland sound, drawing a long line [ _ _ _ _ ]; Swedish as forest sound [/ / / / ] and Norwegian as rock sound [O / O / O]. There is probably only limited etymological logic in that, but it's a wonderful idea: Denmark is so flat that you need deep, base sounds to release into the landscape to reach out. As a Norwegian you would know something like an echo, due to the fjords and mountains. So Henning drew this voice score. His son, the artist Thorbjørn Christiansen, then told me that this typewritten text work was part of the exhibition "Norden" from 2000 in Vienna. During the pre-visit for our performance program in Henning's archive, the Lithuanian composer Arturas Bumšteinas found the real score – Opus 231. For me, not being able to read notes, this is also exciting because it offers a visual path to sound. ALW: Was Henning Christiansen primarily a sound artist? NA: I guess he was first and foremost a composer. Many would rather know his son, Bjørnstjerne, who is a member of the art group Superflex. I always found it intriguing that Superflex once wrote an opera piece for the Copenhagen Opera, which might seem surprising when you don't know that Superflex partly grew up in a composer's house. For Henning everything was about the colour green. Music as green. Painting your ear green. Listening to the sounds of nature. The green ear. He would often appear in green clothes. 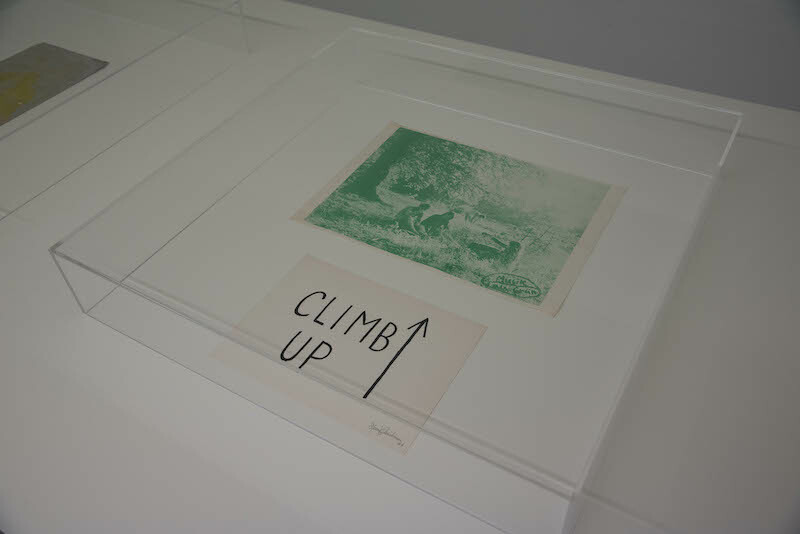 ALW: How familiar were you with Christiansen 's work prior to curating this solo show? NA: I had seen the first works through René Block when I worked at TANAS in Berlin. But I really only went deeper into it when I came to the Kunsthal in 2013. He really produced a lot of works. I was glad to be given the opportunity to see what actually exists from Henning when beginning to prepare this project and to select only a few things and let them have enough space to breath. ALW: Was there ever an institutional retrospective of Henning Christiansen's work? NA: Yes, the retrospective "FLUXID" in 2007 at Den Fries Udstillingsbygning in Copenhagen, for example. This is when the one large book about his work was published. He didn't survive the final making of the catalogue. ALW: Is there an archive of his work that you could access? NA: It's opposite to Kunsthal 44 Møen, in his house, where his widow, the German artist Ursula Reuter Christiansen lives. Her and René Block jointly administer the archive, which is in the process of being sorted and organised and will move eventually to the building where the current exhibition is on view. You can find lots of treasures there. Like, the work that he did for the Danish avant-garde magazine TALBOX in 1969. He and some friends contributed a green toned photo that Bjørn Nørgaard took. It shows Henning Christiansen, Per Kirkeby and Lene Adler Petersen while having picnic. Henning then added "Musik als Grün" [music as green] under the picture. Of course I am not sure about if that was their intention, but I instantly had to think about Manet and his "Le Déjeuner sur l'herbe". I also found a paperwork that simply says "CLIMB UP". If you isolate those two, they are suddenly so strong. 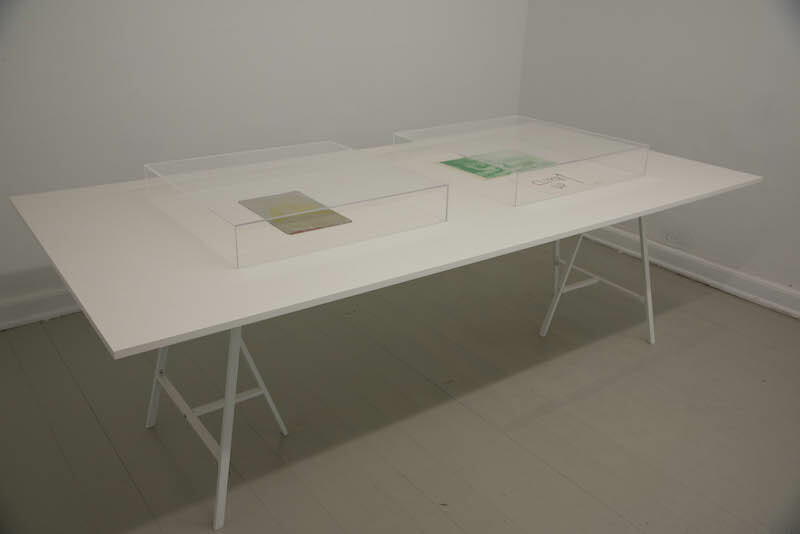 ALW: So you confronted these singular works, for example the green photograph and a green painted record, with each other for the first time? NA: Yes, this particular juxtaposition happens for the first time. 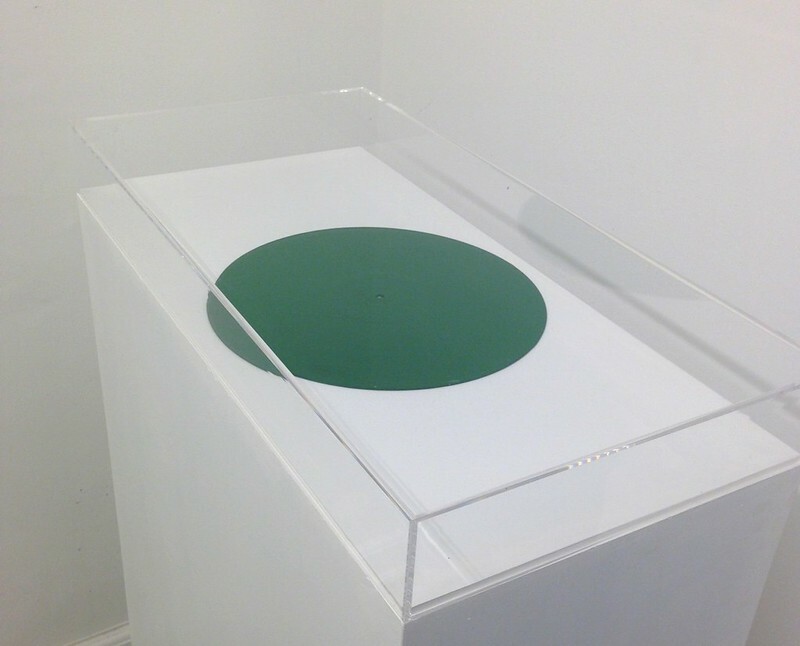 The green record disc is such a simple strategy, and aesthetically beautiful and it makes so much sense within his oeuvre. I feel that's a good thing to show from Christiansen also the more clear and straightforward works, because his art is often rather conceived as eclectic. I am actually not sure if Henning Christiansen would have liked this way of showing it. It's also the first time that I am working on a show of a deceased artist. 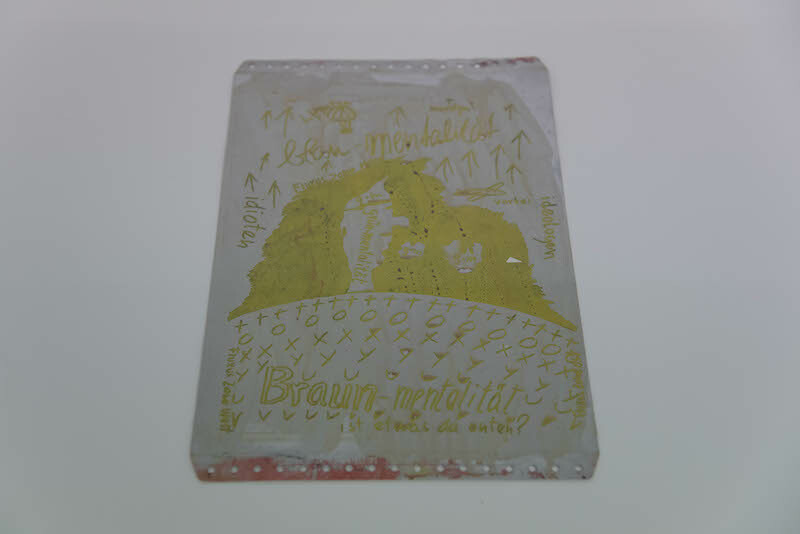 NA: It's a paper layered with metal from the 1980s that the curatorial assistant to the project, Mai Dengsøe Hansen, discovered in his archive while we prepared the exhibition. It shows Denmark as the green mentality, Germany and the continent as brown mentality. North of it is a blue mentality. You can read this manifold: Brown as earthly, grounded, the lands in the north are icy and have the blues; Møn is all about Henning's green. But of course you can also read the colour palette politically. Germany is also divided in Fluxus east and Fluxus west. For Henning, the whole world was Fluxus. And on that map to the far west beyond the Atlantic come the "idiots", toward the Eastern Bloc come the "ideologists". ALW: One idea of Fluxus is that everything can be restaged and re-interpreted. How did this option influence your making of the exhibition? NA: For example, the black and white photograph "Henning's Garden Orchestra" in the exhibition catalogue from Den Fries [Henning Christiansen. Komponist, Fluxist og uden kategori, p. 112] caught my attention and I asked Ursula Reuter Christiansen and Thorbjørn Christiansen about the work. Henning had originally placed different gardening tools against a wall in his courtyard in Møn and gave all the objects a green line of paint. The positioning of the tools is reminiscent of musical notes on a score. We could only find one original object, so Ursula and I looked for new objects to replace the lost ones. And now there is also a hammer on the right side, which is new: a visitor must have placed it there. I had really hoped for an interaction like that to happen. ALW: The exhibition's centrepiece is Henning's video loop "Den vandrende Stemme" [The wandering voice] from 1991. Why do you think does it have such an importance amongst Henning Christiansen's oeuvre? NA: The relevance for me is related to the context of our project on sound, language and landscape. The video shows Henning walking on the beach in Møn. He enters the picture on the right and leaves it on the left side, singing from a score repeatedly one word of objects and situations that are in his immediate surroundings. So he sings to them, calls upon them: "stenen" (the stone), "vinden" (the wind), "havet" (the sea), "skoven" (the forest), etc. The waves of the ocean are like a musical metre underlying everything. It has such honesty and condensed clarity to it. There is a semiotic dimension. But also it has a funny component, when he looks down to the score, looks up and then sings seven times to the beach: "THE BEACH". ALW: You invited contemporary performers to re-interpret Henning's notions of language in the respective landscapes. 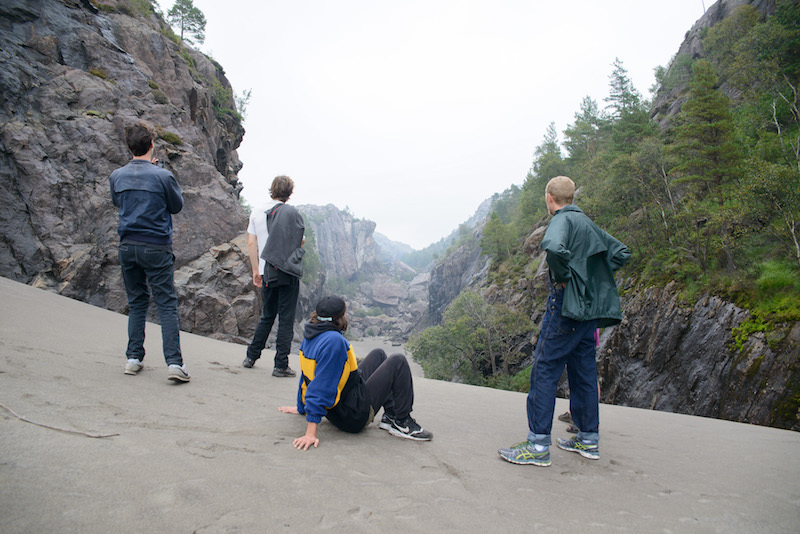 The first performances took place in June at the Kunsthal 44 Møen; now you travelled on to different locations in Norway. What is the idea behind that on-going project? NA: It was first after working here at Kunsthal 44 Møen for the second year that I discovered the text about the sound of landscapes. 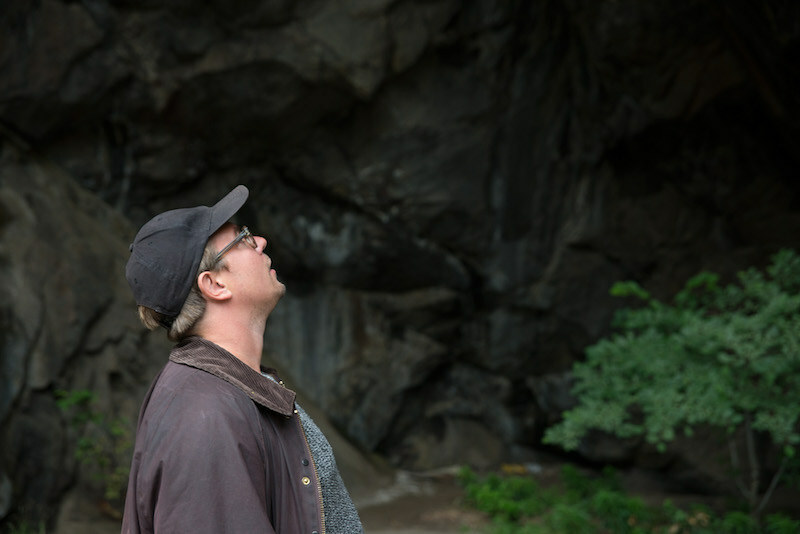 It was tempting to initiate a project from the very start that would transport Henning's ideas into the landscapes in Denmark, Norway and Sweden, and therewith bring performances into those settings that he had thought of. The centrepiece "Den vandrende Stemme" travels with us to each location. I invited the artists Sven-Åke Johansson, Arturas Bumšteinas, Linda Persson, Camille Norment and the artist group LOL Beslutning to create new pieces that are based on Henning's work, or to re-create own works that could stand in relationship to Christiansen. I didn't set any particular rules. 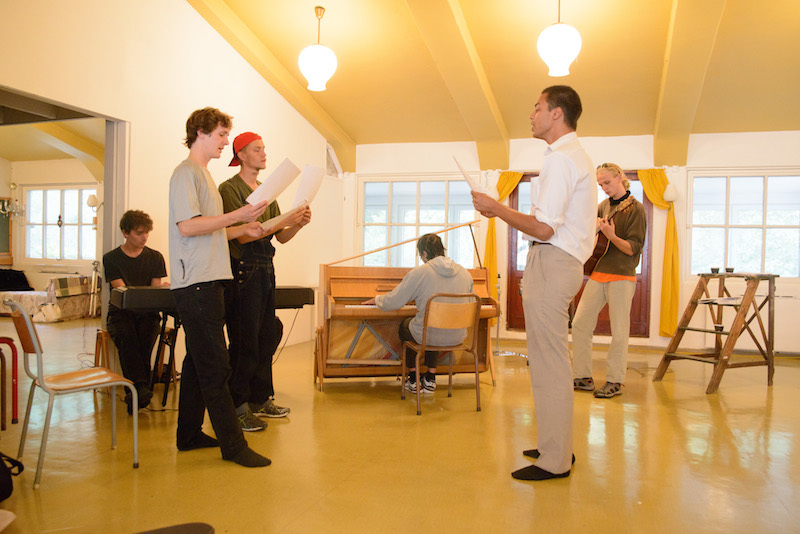 Rather, I wanted this travelling performance program to be a framework for the artists to operate in and try things out. ALW: What are the performances about? NA: The Swedish artist Sven-Åke Johansson, for example, performed "Sounds Of A Tropical Rainforest In America" on Møn. This work combines sound recordings from the rainforest in Peru, played from two separate CD-players, including two people who operate them – one dry season, one rain season and the live sound of two typewriters as instruments, played by two other performers. They type the names of animals that are in the recording. What we hear is the clicking from the keyboard and that sounds very much like another animal. It's also performed in darkness and, by chance, there was heavy rain on Møn during the performance. The composer Arturas Bumšteinas reinterpreted Henning Christiansen's "Fluxorum Organum" – a piece that Henning wrote for Joseph Beuys' "Eurasienstab". We also had a "Skype duet for two pianos between Oslo and Møn", conducted by the American artist Camille Norment who lives in Oslo. Her grand piano in Oslo was connected to an old grand piano in one of the neighbouring buildings of the Kunsthal via Skype. There was a long cue of visitors who would then play duets with her. On a general level, one could say this ties into a FLUXUS tradition: to reinterpret what can function as an instrument, or how one can alter the use of the instrument as such. George Maciunas had suggested that kicking a piano would say much clearer something about the hollowness of that object. Specifically within our setting the bridging of two places via Skype, a travelling voice, and the errors of a breaking Skype connection seemed fruitful. 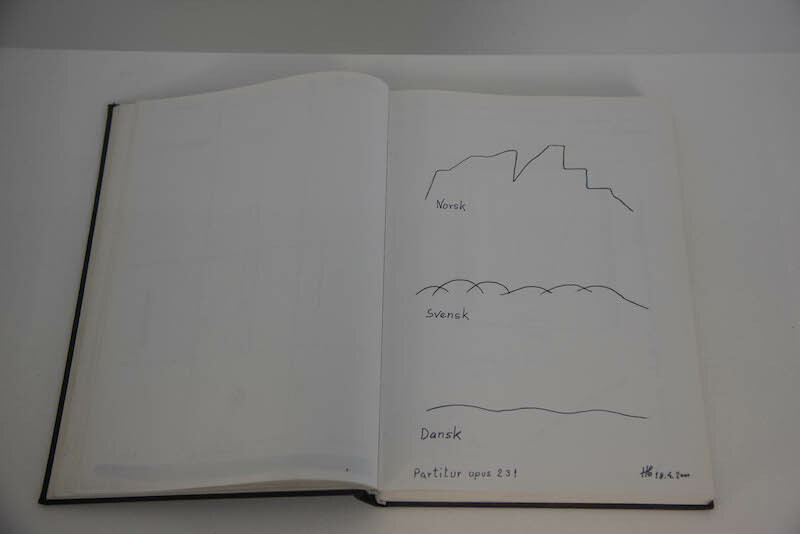 Like logic expansions of Henning's themes: he loved the phone as an instrument and had three artists call from Denmark, Sweden and Norway in the "Norden" exhibition in 2000. NA: Absolutely! And also to travel together with people. It's a lot about having time to think things through in different places, see how the surroundings shape the mind, the practice. I enjoy creating that kind of a frame and things will begin to happen automatically. Also between generations: Sven-Åke Johansson is in the beginning of his seventies, whereas Arturas Bumšteinas is in his thirties. When I called Bumšteinas to ask about participating in the project he said: "Fluxus is my mother and Henning Christiansen is my father." ALW: Did the performance iterations in Velferden in Norway differ contextually from those in Denmark at the Kunsthal in Møn? NA: Very much. We were on the grounds of an abandoned mine. Many concerts and performances happened in a 1950s miners' building, in their old dining hall or a workshop with machinery next to it. 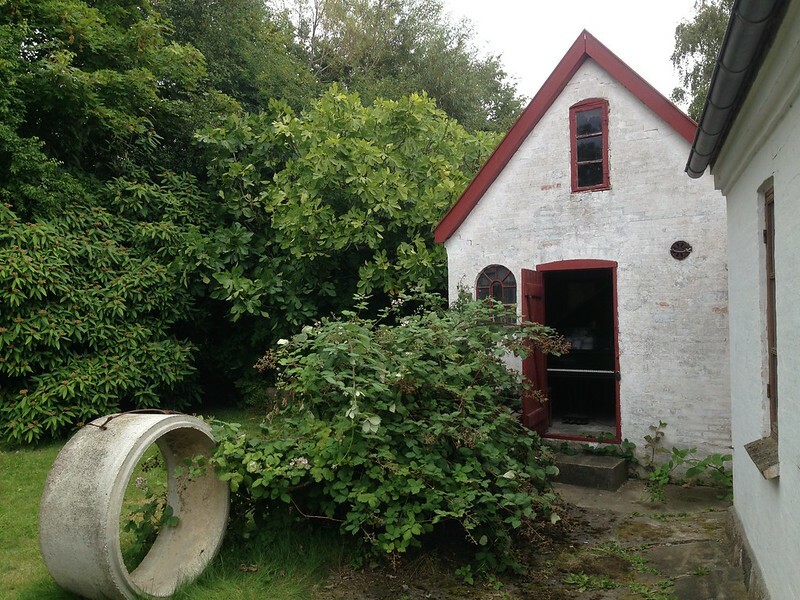 The Norwegian Maiken Stene started to transform these buildings into an art space and she will host residencies in the future. When I came to this place almost two years ago, I felt this is where we need to go. The harsh mountains of rock piling up to your left and right of the TITANIA mine. A manmade desert is in the middle as a result of mineral extraction from the rocks. In the next town, Sokndale, we found a breath-taking wooden church. On Møn we started in the fields, a wheat barn, the Kunsthal and ended in the stone Fanefjord church. Here LOL Beslutning interpreted a TV crime opera that Christiansen had written in the 1980s called "Destine & Destina og den otteøjne Skorpion" [Destine & Destina and the eight eyed Scorpio]. 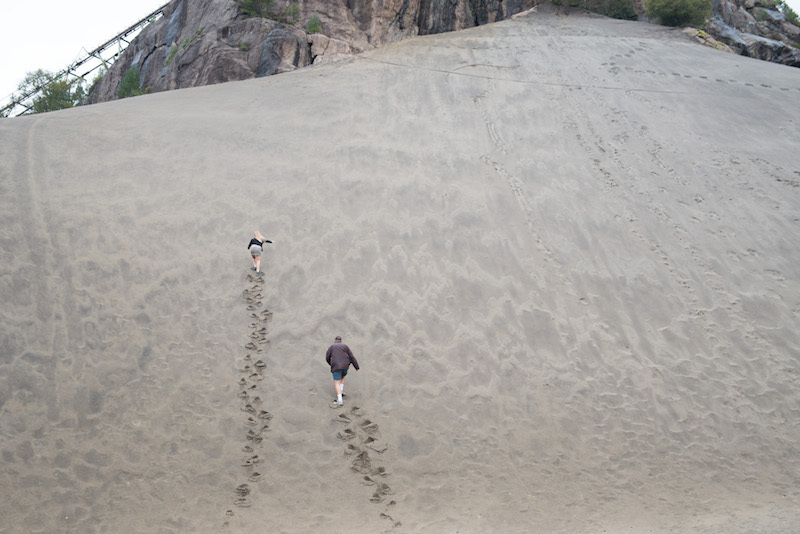 In Norway we set off in the wooden church with Sven-Åke Johansson and then went out into the rocky landscape. We ended, once again, with LOL Beslutning and their second interpretation of the opera – this time though in the old dining hall of the miners' building with great acoustics. ALW: How do the performers, for example Linda Persson, respond to the dramatic mountains in Norway as opposed to the flat land in Denmark? NA: Linda's piece in Norway made use of the actual rocks and stones. 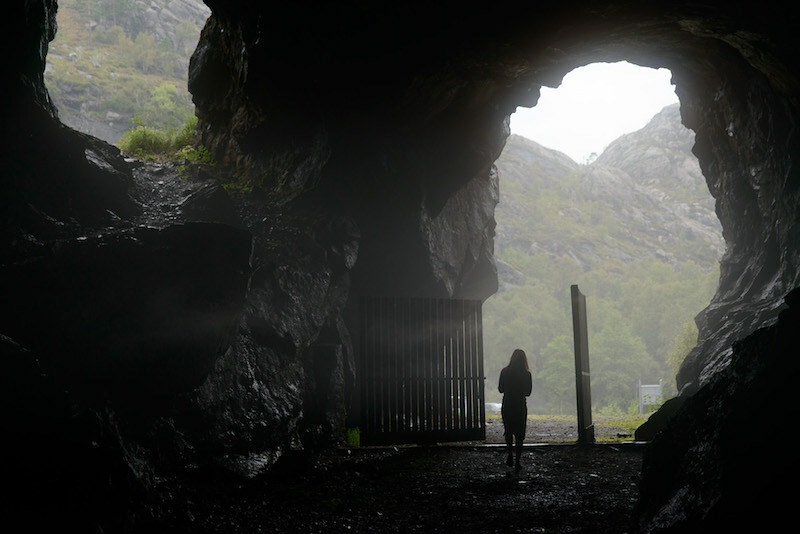 Through a ritualistic performance outside she called upon the rocks to activate them not far from the entrance to the former mine. It was different, but not unrelated to Henning's calling on the sea, sand and wind in "Den vandrende stemme". In collaboration with Pip Stafford from Tasmania she then tried to extract sounds from the stones in relation to their electromagnetic frequencies. This happened in a workshop building with heavy machinery. On Møn she had offered to find your kin animal through a sound installation in a green construction in the garden behind the Kunsthal. The Møn piece was called "The Green Room: after Henning, all the cage is a stage", which also relates to Christinansen's fascination for the sounds of animals, particularly birds. This soundscape of constant tweeting is omnipresent on Møn. In Norway it was really more about the intimidating, yet intriguing rocks around you and the potential sounds they hide: "(S)tone Tension ritual [Frequency/Tension]". ALW: On Møn you had performances taking place at the small church Fanefjord close to the Kunsthal, while in Sokndale there were pieces staged in a small wooden church. How do the sacral architecture and its religious connotations correspond to Fluxus? NA: Maybe in that sense that in Norway Arturas Bumšteinas worked further with the "Eurasienstab" / "Fluxorum Organum" theme, but this time it was actually played from the church's organ. Bumšteinas also has an on-going body of work called "Organ Safari" in which he "hunts" not animals, but organ sounds worldwide. In Norway, while "Fluxorum Organum" came from the organ, he talked about a pair of tree branches that survived from the tree that George Maciunas had planted in SoHo in 1967. The same year that "Fluxorum Organum" was composed. Bumšteinas happened to take two sticks from that tree just before the city authorities chopped it down some years ago. For our project in Norway Bumšteinas developed a piece with the title "Mess(a) for fallen trees and insects" that included also a minute of silence for the passed away Fluxus trees in New York. In some regards that felt like a funeral service. ALW: How relevant is the fact that all the locations that you chose for the performances are in completely rural and isolated locations? NA: It's indeed very much about connecting remote art spaces like Kunsthal 44 Møen with similar institutions in other countries. Although the Kunsthal is far away from any big centre, about a hundred people travelled to our opening here, only to see the performances. This also brings really exciting people together, who will spend time together at an isolated location on the countryside. Last year Mikkel Rosengaard visited Kunsthal 44 Møen and wrote a text about it for ATLAS magazine titled after a quote from Bjørn Nørgaard that says, "The centre of the art is where we are." That doesn't mean that specifically this place, this artist, at this time is the one centre, but Nørgaard suggests that wherever and whenever interactions like these happen between artists, musicians, curators, composers, one of many centres within the art system manifests itself in this very moment. And that is something I enjoy contributing to. * Bjørn Nørgaard, in: Henning Christiansen. Komponist, Fluxist og uden kategori, SOHN, 2011, p. 467. ** Henning Christansen, in: Henning Christiansen. Komponist, Fluxist og uden kategori, SOHN, 2011, p. 91. The mouth expresses thoughts. The landscape renders its tone!